The QuestionPoint user group meeting was held on Monday, January 14 from 10:30 to Noon at the Philadelphia Free Library. Approximately 40 people attended the meeting. A special thank you to the Free Library for providing a lovely meeting room in this historic building! Stewart Bodner (New York PL) and Joe Thompson (Maryland AskUsNow! ), representing the QP User Council, opened the meeting shortly after 10:30 AM. After welcome and introductions, the members of the QuestionPoint User Council and 24/7 Reference Advisory Board were recognized. On the Librarian side, the Qwidget questions will appear in the chat interface in the same manner that a web-based chat session would appear. Qwidget sessions will be noted as such in the interface and in the Active Questions list. Librarians will be able to configure how (or if) Qwidget will appear to their users, from the Institution Settings area in the Administration module. As a result of behind-the-scenes work on the patron chat interface, the patron interface is now lighter, and thus faster. In addition, the next generation version of the patron interface will be changed to incorporate the features of Chat 2. With the chat on the left-hand side (see illustration below) and the inclusion of the Chat 2 patron preferences, the patron interface will now be universally accessible. These changes will be in place with the next software install, in March 2008. With the next install, reports will be accessible in one location. This will create new and easier workflow for report creation and export. 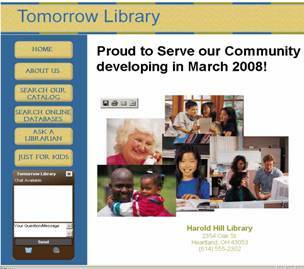 Currently there are about 1,430 libraries participating in the 24/7 Reference Cooperative. Minnesota is the newest statewide member (our 13th state!). Almost 350,000 chat sessions came into the Cooperative service in calendar year 2007, and of those the Cooperative librarians handled a little under 200,000 of them (with the QP back up staff handling the rest). Early in February, QuestionPoint will debut the QuestionPoint wiki. The wiki will contain promotional ideas and success stories from QP libraries, ready reference resources, the 24/7 Reference Policies, and more. Best Practices for the 24/7 Reference Cooperative were briefly reviewed, specifically the top 10 Quality issues for 2007 [see http://questionpoint.blogs.com/questionpoint_247_referen/2008/01/2007-the-year-i.html]. The resolution codes, particularly the “Lost Call” resolution code, was discussed at length. The 24/7 Reference Advisory Board will be taking another look at this particular code. 1. How do you handle a colleague not picking up patrons while you are busy with one or more and there is a queue waiting from your own institution or state? There are several ways to handle this. If you are busy helping a patron and you see a patron come in from your own library, then you can elect to pick up the second patron, especially if all the other librarians online are also busy. When picking up the second patron, go ahead and send the greeting message, then explain that it may be a few moments while you finish up with your first patron. This is especially recommended if you are almost finished with the first patron. We will publish tips on how to pick up a 2nd patron in the Quality Tips later this month. On the other hand, if you are in the midst of your first chat session, you can leave the 2nd patron for another librarian to pick up. If it is a patron from your own queue, the other librarians in the Cooperative will wait 60 seconds before picking up (to give you a chance to pick up). After 60 seconds have elapsed, then this patron will be picked up by one of the other librarians online. There are occasions when the other librarians online are not busy yet do not pick up, even after waiting 60 seconds. If you note this happening, please send a message to [email protected] noting the date, time (include the time zone), and circumstances. This will help us assure that all librarians are staffing appropriately for the Cooperative. 2. The fact that Question is an optional field so you don’t necessarily know before you pick up. If you host your own chat form, please see the documentation at http://www.questionpoint.org/support/documentation/templates/requiringquestionfields.html#text_val, which describes how to make a field mandatory. If you or your IT staff follow these instructions for your chat form, you can ensure all your chat requests are received with the Question field completed. If you have OCLC host your chat forms for you, just ask us to make the field required for your form. Members of the 24/7 Cooperative are encouraged to let us make the field required, and that is the default unless we are specifically asked to allow it to be optional. 3. Gettting a negative user survey when you’ve told them you will send further information. Could survey be delayed and done twice? The survey can certainly be completed as many times as the patron wishes. When the additional information is sent, perhaps the librarian could ask the patron to complete the survey based on the information just sent. We will, however, note the request to allow a delaying mechanism for the survey and enter it into our requests tracking system to be evaluated for a future release. 4. Is it possible to take questions via the Qwidget through e-mail (assuming no librarian is online) if the library uses QP for chat only? We don’t use QP for e-mail. During your setup for the Qwidget, in the Administration module, you will have the option to have the question sent via e-mail when no one is monitoring. This function does not require that you use QuestionPoint e-mail; it is associated only with the Qwidget feature. 5. Has OCLC/QP released a hosted intake form that a QP institution can use for live chat only (we don’t do QP e-mail and we are getting spam in our chat). Thank you for this suggestion, which we will log in our requests-tracking system. In the meantime, is it possible to send off a quick “stand by” script to stop the ding and give you time to finish what you are doing? Do others have suggestions for dealing with this? 7. Developing a communication method for librarians and users outside of QuestionPoint. We’re a little unclear about this suggestion and would appreciate additional description. If “users” means patrons, there is a method to contact the patron without changing the status of a question. User the Answer button, then click on the Send Message button after typing in your message. If you need a way to correspond with another librarian about the question, there is the Send Message to Librarian link on the Full Question page. This allows communication with the librarian previously handling the question/transcript. However, if the request is for a different scenario, please contact us with more detail, or even respond here if you wish. We’ll track the request and evaluate for a later release. 8. Cobrowse often doesn’t work for me. Patron doesn’t find on their screen. Please be sure that you have cleared your cache before logging into chat. It may be that the patron needs to do that, as well. Also remember that patrons must be using IE and Windows for cobrowse to work. If you still experience problems, contact our support staff at [email protected]. Even if they are not able to resolve the issue for you, they can pass the problem on to product and development staff. Thanks to all who attended our user group meeting in Philadelphia! We will be meeting at ALA Annual, in Anaheim, and also at the PLA conference, in Minneapolis. Stay tuned for details! In last week’s Quality Tip, we cautioned against providing only a citation to a book in the library if a patron is seeking general information online (and may not have access to the library’s collection). However there are many times that the patron is interested in finding a specific item within the library’s collection, but can’t find what he needs. A user’s search may fail if he simply types the title in the keyword field. Such a search may provide too many hits and may even lead the user to conclude the library does not own the item. The expertise of librarians is useful in these situations, as we are familiar with other search options such limiting the keyword search to certain fields (like title), or using an index (such as “title browse”). Patron: Could you give me the [ABC University] library call number for the "Statistical Abstract of the United States"? Patron: covers from 1958 through current year minus 2. Librarian: Do any of those titles cover what you need? Patron: No. The set is titled "Statistical Abstract of the United States". Annual Govt pub. Librarian: Did you originally find this title in the online catalog? Patron: No, but its in the public library. Librarian: I’d be happy to pass your question along to the local staff and have them email you back with an answer. If you can wait a few days, one of our librarians can get back to you with more information. Would you like me to do that? What's the latest date that you can use this information? Librarian: Are you still there? I want to make sure we haven't been disconnected. Patron: Please send email with [university library] call number if available. Latest date: your convenience. Librarian: Can you verify your complete email address for me? Librarian: Can I help you with anything else? Librarian: We will forward your request to your university librarian. They should respond to you via email as soon as possible. Goodbye and thank you for using our service. How could the librarian improve this search? Use title browse, rather than a keyword search. If you are unsure of the title, then truncate (a title browse search for “statistical abstr” would get to the correct point in the title browse index list, where a title browse using an incorrect title (“Statistical Abstracts”) would place you at the end of the list. Be sure to look at the next page of results: the record for the Statistical Abstract was on the second page of the results in this example. If you search the opac for a known item and your first attempt doesn’t locate the desired item, particularly when it is a common item or series title, try title browse if a keyword search yields too many results to sift through. When someone takes the trouble to contact a librarian, we should be sure we do our best to provide useful information to that person – information they can use. A response that is perfect for patrons inside the library may not be as ideal for virtual patrons. Librarian: you should begin with an encyclopedia - and then use the history databases in your library. The librarian did a great job by pinpointing a helpful resource inside the library. But is the patron inside the library? In fact, this patron stated that he didn’t have access to library databases or encyclopedias, indicating he is probably not in the library and possibly not affiliated with the library site he used to contact the virtual reference service. This patron indicated he didn't have access to databases or an encyclopedia. Why not? The librarian could find out if the patron is affiliated with the site used to ask the question. If this patron arrived via a link on an academic site, is he not a student at the college? Or, is he simply having trouble logging into a database? If a public library user, information about the databases and resources available remotely from his library would be useful, even if he doesn’t have access at the moment. Does he live somewhere other than the place he used the VR service? These issues could be settled by having a conversation with the user, rather than simply sending him a citation. In addition, there are several useful bibliographies on college Web pages that list numerous sources on Louis XIV, available freely on the web, that could provide additional information. A reference interview would help determine if this is for an assignment and grade level. This would help in determining what type of resource to send. There are other issues to point out (the recommended greeting wasn’t used; there was not a “final satisfaction” question, etc.) It is wonderful service to refer the patron to a book at the library, but the key is to provide the online patron with resources appropriate to their information request. To do that, engage the user in conversation and listen to what they say, then respond accordingly. This will help us give the user what they can really use. Incoming email messages will be parsed by the server, and any instance of the use of the “<” character will be translated to “&lt” in order to incapacitate any automated scripting. When viewed from within your QuestionPoint account, the "<" will display correctly, but if the transcript is emailed out to another person or sent in a reply, the "<" character will be replaced by "&lt", to avoid further unwitting propagation of the potentially nefarious script. The install on Tuesday January 15th, will result in the QuestionPoint service being unavailable for approximately 15 minutes between 6:00AM and 6:15 AM EST (11:00 GMT to 11:15 GMT). As always, please check your question lists after the server bounce, to see if any sessions were truncated or missed. Please note that this fix will not stop incoming spam e-mail messages. It will however, keep those messages from doing harm to the system overall. We are continuing to develop other spam-fighting techniques with an eye to deployment over the next two months. Stay tuned! Qwidget combines the power of QuestionPoint's reference management system with the simplicity of a widget. On the librarian side, the interface is the same as it is today, with all the tools you need to collaboratively handle chat patrons, review and refer session transcripts, and obtain reports and statistics on chat activity. On the patron side, you will be able to provide access to your chat service via a widget, which will connect to your QuestionPoint account. When you deploy Qwidget on your library web site, your users will enter your service through the widget interface. 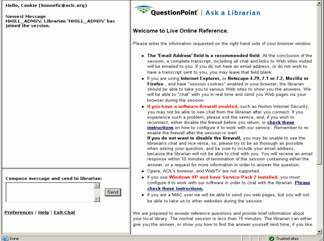 On the librarian side, they will appear in the chat monitor inside QuestionPoint. This allows multiple librarians to use your existing QuestionPoint account to handle users that come in via the widget, along with all other patrons arriving via the web-based chat and email forms in use today. The same collaborative and administrative tools would be available as well. A widget is a small application that adds utility or other information from external sources, via html code that you add to your webpage. For additional information, see: http://en.wikipedia.org/wiki/Web_widget. A common widget used by several libraries is the MeeboMe widget (Meebo is a web-based IM service). Widgets are popular among users: according to Jupiter Research (Oct. 2007), awareness and use of Widgets among online users, which was less than 5% in early 2007, has now increased: 39% of online users are aware of widgets, and 26% have used them. Qwidget will be available as part of QuestionPoint. A preview version of Qwidget will be available after our next software install (currently scheduled for March 2008). We will be showing a pre-release view of Qwidget at the OCLC booth (booth #1543) at ALA Midwinter, as well as at our QP User Group meeting [January 14, 10:30 to noon, see http://questionpoint.blogs.com/questionpoint_247_referen/2007/12/questionpoint-e.html ] In addition, we plan to hold a virtual user group meeting prior to the release - details will be sent via the listserv and posted on this Blog. In order to maintain the highest standards, each 24/7 Reference Cooperative library is tasked with reviewing both the session transcripts and the survey responses from their library's patrons on a regular basis, at least once a week if not more frequently. If a transcript demonstrates that the 24/7 Reference Policies and Best Practices have not been followed, or if there is any other issue with the transcript -- or to send a compliment to the chatting librarian -- then refer the transcript to Quality [Note: those libraries involved in statewide or regional services may have additional avenues with your statewide/regional coordinator to address quality issues]. And now, on to our review of 2007. Approximately 1,200 sessions were referred to Quality in 2007 (total Cooperative sessions for 2007 was 349,796, so roughly 0.34% of all sessions were referred to Quality). 2. Policy Page was not consulted; information was on the policy page which would have answered the patron's question. 4. Descriptive Codes: Chatting librarian used descriptive codes when session was not from his library. 6. Contact Library / Follow-up Option: Librarian told the patron to contact his library (by phone or visit), without offering the option for email follow-up. It wasn’t all complaints: we get lots of compliments sent to Quality too. Compliments could have tied for 8th on the list if we included those. The good news is the issues of "picked up too soon" and "abandoned call" have improved significantly since May 2007. The lack of a "final satisfaction" question and failure to obtain patron's email address (for follow up purposes) are 2 issues that made the list in May, and are still occurring, but have now dropped to about 11th place on our list. The "descriptive code" issue had the most change--we only noticed it 26 times from January to May but 97 times from May to December. Thanks to all supervisors who send issues to Quality! With 340,000 sessions per year (and growing), we do rely on you to help us target issues that need to be addressed. Also a special thank you to Wren Spangler and the Quality Team, who continue to do a great job with addressing quality issues in the Cooperative. From "OCLC Abstracts, 17 December 2007"
At 5:26 p.m. local time on November 29th, a user of Bibliotheek Waterland, the public library in and around Purmerend, the Netherlands, logged on to the [email protected] reference service and asked the question: “What is the distribution of market share for automobiles in Belgium, the Netherlands, Germany and the U.K.?” It was the 3 millionth question logged on QuestionPoint, the virtual reference desk developed by OCLC and the Library of Congress and the system that hosts the Netherlands’ [email protected] service. The question was forwarded to and answered by specialists on this subject of the Openbare Bibliotheek Groningen.